Now I would like to make a report to the Seventeenth National Congress of the Communist Party of China (CPC) on behalf of the Sixteenth Central Committee. 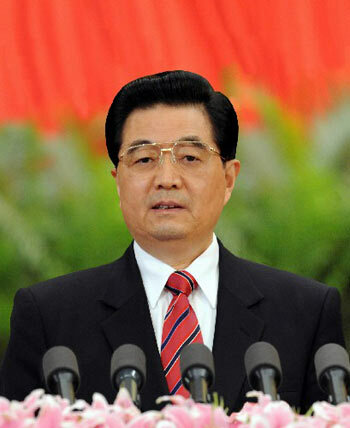 The Seventeenth Congress is one of vital importance being held at a crucial stage of China's reform and development. The theme of the congress is to hold high the great banner of socialism with Chinese characteristics, follow the guidance of Deng Xiaoping Theory and the important thought of Three Represents, thoroughly apply the Scientific Outlook on Development, continue to emancipate the mind, persist in reform and opening up, pursue development in a scientific way, promote social harmony, and strive for new victories in building a moderately prosperous society in all respects. The great banner of socialism with Chinese characteristics is the banner guiding development and progress in contemporary China and rallying the whole Party and the people of all ethnic groups in the country in our common endeavor. Emancipating the mind is a magic instrument for developing socialism with Chinese characteristics, reform and opening up provide a strong driving force for developing it, and scientific development and social harmony are basic requirements for developing it. Building a moderately prosperous society in all respects is a goal for the Party and the state to reach by 2020, and represents the fundamental interests of the people of all ethnic groups. The world today is undergoing extensive and profound changes, and contemporary China is going through a wide-ranging and deep-going transformation. This brings us unprecedented opportunities as well as unprecedented challenges, with the formeroutweighing the latter. The whole Party must unswervingly hold high the great banner of socialism with Chinese characteristics and lead the people in starting from this new historical point, grasping and making the most of the important period of strategic opportunities, staying realistic and pragmatic, forging ahead with determination, continuing to build a moderately prosperous society in all respects and accelerate socialist modernization, and accomplishing the lofty mission bestowed by the times. The five years since the Sixteenth Congress was an extraordinary period. In order to accomplish the arduous tasks of reform and development in a complicated and volatile international situation, the Party led the people of all ethnic groups in holding high the great banner of Deng Xiaoping Theory and the important thought of Three Represents, overcoming difficulties and risks, creating a new situation in the cause of socialism with Chinese characteristics and attaining a new realm in adapting Marxism to conditions in China. At its Sixteenth Congress the Party established the important thought of Three Represents as its guide and made the strategic decision to build a moderately prosperous society in all respects. In order to implement the guiding principles of the congress, the Central Committee convened seven plenary sessions, at which it made decisions on and arrangements for major issues of overall significance such as deepening institutional restructuring, improving the socialist market economy, strengthening the governance capability of the Party, drawing up the Eleventh Five-Year Plan (2006-10), and building a harmonious socialist society; and it formulated and applied the Scientific Outlook on Development and other major strategic thoughts. All this helped the Party and the state score great new achievements. Economic strength increased substantially. The economy sustained steady and rapid growth. The GDP expanded by an annual average of over 10%. Economic performance improved significantly, national revenue rose markedly year by year, and prices were basically stable. Efforts to build a new socialist countryside yielded solid results, and development among regions became more balanced. The endeavor to make China an innovative nation registered good progress, with considerable improvement in the country's capacity for independent innovation. Notable achievements were scored in the construction of infrastructure including energy, transport and telecommunications facilities and other key projects. Manned spaceflights were successfully conducted. Fresh progress was registered in energy, resources, ecological and environmental conservation. The Tenth Five-Year Plan (2001-05) was fulfilled successfully and implementation of the eleventh is in smooth progress. Major breakthroughs were made in reform and opening up. Comprehensive reforms in rural areas gradually deepened; agricultural tax, livestock tax and taxes on special agricultural products were rescinded throughout the country; and policies were constantly strengthened to support and benefit agriculture, rural areas and farmers. Significant headway was made in reform of the state assets management system, state-owned enterprises, banking, public finance, taxation, investment, pricing, and the system for managing science and technology. The non-public sector of the economy grew stronger. A sound market system was being put in place, macroeconomic regulation continued to improve, and transformation of government functions was accelerated. The total volume of imports and exports increased sharply. Solid steps were taken in implementing the "go global" strategy, and the open economy entered a new stage of development. Living standards improved significantly. Both urban and rural incomes increased considerably, and most families had more property than before. The system of subsistence allowances for urban and rural residents was basically in place, guaranteeing basic living conditions for the poor. Residents improved their consumption patterns, had increasingly better food, clothing, housing, transport and other daily necessities, and enjoyed markedly improved public services. Fresh progress was registered in improving democracy and the legal system. Political restructuring progressed steadily. Constant improvement was made in the system of people's congresses, the system of multiparty cooperation and political consultation under the leadership of the CPC and the system of regional ethnic autonomy. Primary-level democracy increased its vitality. The cause of human rights witnessed sound development. The patriotic united front grew stronger. A socialist law system with Chinese characteristics was basically in place. The rule of law was effectively implemented as a fundamental principle. Reform of the government administration system and the judicial system continued to deepen. A new situation was created in cultural development. Efforts to establish the system of socialist core values made steady headway and marked achievements were scored in the Project to Study and Develop Marxist Theory. Extensive efforts were made to raise ideological and ethical standards and the whole of society became more culturally advanced. Cultural restructuring made important progress, cultural programs and the cultural industry developed rapidly, and the people enjoyed a richer cultural life. Fresh progress was made in public fitness programs and competitive sports. Social development proceeded in an all-round way. Education of various kinds and at different levels developed rapidly. Free compulsory education was made available in all rural areas. More job opportunities were created. The social security system was strengthened. The battle against SARS came to a great victory. The public health system and basic medical care constantly improved, contributing to better health of the people. Social management improved step by step. Social stability was ensured and the people lived and worked in peace and contentment. Historic achievements were scored in the development of national defense and the armed forces. The revolution in military affairs with Chinese characteristics was accelerated. The armed forces were reduced by 200,000 troops. Efforts were intensified in all respects to make the armed forces more revolutionary, modernized and standardized, which notably increased their capacity to accomplish their historical missions at this new stage in the new century. Work related to Hong Kong, Macao and Taiwan affairs was intensified. Hong Kong and Macao maintained their prosperity and stability and developed closer economic partnership with the mainland. Political parties on both sides of the Taiwan Straits started communication, and cross-Straits visits as well as economic and cultural exchanges reached a new high. The Anti-Secession Law was enacted to resolutely safeguard China's sovereignty and territorial integrity. Major progress was made in all-directional diplomacy. Pursuing an independent foreign policy of peace, China energetically carried out diplomatic activities, enhanced exchanges and cooperation with other countries in various fields and played a major constructive role in international affairs. This created a favorable international environment for building a moderately prosperous society in all respects. The great new undertaking to build the Party made solid progress. Endeavors to strengthen the Party's governance capability and vanguard nature were intensified. Efforts to make theoretical innovations and arm Party members with the achievements proved successful. The campaign to educate Party members to preserve their vanguard nature yielded substantial results. Intra-Party democracy continued to expand. Major headway was made in strengthening the Party's leading bodies and the ranks of its cadres, and especially in educating and training cadres. Work in relation to talented personnel was strengthened. Efforts were stepped up to reform the cadre and personnel system and make innovations in the organizational system. Remarkable results were achieved in improving the Party's style of work, upholding integrity and combating corruption. While recognizing our achievements, we must be well aware that they still fall short of the expectations of the people and that there are still quite a few difficulties and problems on our way forward. The outstanding ones include the following: Our economic growth is realized at an excessively high cost of resources and the environment. There remains an imbalance in development between urban and rural areas, among regions, and between the economy and society. It has become more difficult to bring about a steady growth of agriculture and continued increase in farmers' incomes. There are still many problems affecting people's immediate interests in areas such as employment, social security, income distribution, education, public health, housing, work safety, administration of justice and public order; and some low-income people lead a rather difficult life. More efforts are needed to promote ideological and ethical progress. The governance capability of the Party falls somewhat short of the need to deal with the new situation and tasks. In-depth investigations and studies have yet to be conducted on some major practical issues related to reform, development and stability. Some primary Party organizations are weak and lax. A small number of Party cadres are not honest and upright, their formalism and bureaucratism are quite conspicuous, and extravagance, waste, corruption and other undesirable behavior are still serious problems with them. We must pay close attention to these problems and continue our efforts to solve them. To sum up, the past five years was a period in which substantial progress was made in reform, opening up and building a moderately prosperous society in all respects. During this period, China's overall strength grew considerably and the people enjoyed more tangible benefits. China's international standing and influence rose notably. The creativity, cohesion and combat effectiveness of the Party increased significantly, and the whole Party and the people of all ethnic groups became more united. Facts have proved that the major policy decisions made by the Central Committee at and since the Sixteenth Congress are perfectly correct. Our achievements over the past five years are attributed to the concerted efforts of the whole Party and the people of all ethnic groups. On behalf of the Central Committee, I wish to express our heartfelt thanks to the people of all ethnic groups, the democratic parties, people's organizations and patriots from all walks of life, to our compatriots in the special administrative regions of Hong Kong and Macao and in Taiwan as well as overseas Chinese nationals, and to our foreign friends who care about and support China's modernization drive! We will soon be celebrating the 30th anniversary of the start of reform and opening up. In 1978, the Party held the historic Third Plenary Session of the Eleventh Central Committee, which ushered in the new historical period of reform and opening up. Since then, the Chinese Communists and the Chinese people have, in an indomitable enterprising spirit and with their spectacular practice of innovation, composed a new epic recounting the Chinese nation's ceaseless efforts to make progress and become stronger, and historic changes have taken place in the visages of the Chinese people, socialist China and the CPC. Reform and opening up represent a great new revolution carried on by the people under the Party's leadership in a new era to release and develop the productive forces, modernize the country, bring prosperity to the Chinese people and achieve the great rejuvenation of the Chinese nation; to promote the self-improvement and development of China's socialist system, inject new vitality into socialism, and build and develop socialism with Chinese characteristics; and to improve the building of the Party as it leads contemporary China in development and progress, preserve and enhance its vanguard nature, and ensure that it is always in the forefront of the times. We must never forget that the great cause of reform and opening up was conducted on a foundation laid by the Party's first generation of central collective leadership with Comrade Mao Zedong at its core, which founded Mao Zedong Thought, led the whole Party and the people of all ethnic groups in establishing the People's Republic and scoring great achievements in our socialist revolution and construction, and gained invaluable experience in its painstaking exploration for laws governing socialist construction. The victory in the new-democratic revolution and the establishment of the basic system of socialism provided the fundamental political prerequisite and institutional basis for every inch of development and progress in contemporary China. We must never forget that the great cause of reform and opening up was initiated by the Party's second generation of central collective leadership with Comrade Deng Xiaoping at its core leading the whole Party and the people of all ethnic groups in the endeavor. In a precarious situation left by the "cultural revolution" (1966-76), the second generation of central collective leadership, persisting in emancipating the mind and seeking truth from facts and displaying immense political and theoretical courage, made a scientific appraisal of Comrade Mao Zedong and Mao Zedong Thought, thoroughly repudiated the erroneous theory and practice of "taking class struggle as the key link," and made the historic policy decision to shift the focus of the work of the Party and the state onto economic development and introduce reform and opening up. It established the basic line for the primary stage of socialism, sounded the clarion call of the times for taking our own road and building socialism with Chinese characteristics, founded Deng Xiaoping Theory, and led the whole Party and the people of all ethnic groups in striding forward on the great journey of reform and opening up. We must never forget that the great cause of reform and opening up was carried on, developed and successfully carried into the 21st century by the Party's third generation of central collective leadership with Comrade Jiang Zemin at its core leading the whole Party and the people of all ethnic groups on this mission. From the Fourth Plenary Session of the Thirteenth Central Committee through the Sixteenth Congress, the third generation of central collective leadership, which took over the helm at a critical historical juncture, held high the great banner of Deng Xiaoping Theory, pressed ahead with reform and opening up and kept up with the times. Relying on the Party and the people, it stood the severe tests of political turbulences and economic risks at home and abroad, safeguarded socialism with Chinese characteristics, initiated the new, socialist market economy and ushered in a new phase of all-round opening up; and it advanced the great new undertaking to build the Party, founded the important thought of Three Represents, and steered the ship of reform and opening up forward on the right course. Since the Sixteenth Congress, we have followed the guidance of Deng Xiaoping Theory and the important thought of Three Represents, kept up with new developments and changes in and outside China, grasped the strategic opportunities in this important period, promoted the truth-seeking, pragmatic and pioneering spirit and persisted in innovation in both theory and practice. We have worked hard to promote scientific development and social harmony, improved the socialist market economy, and resolutely carried forward the great cause of reform and opening up in building a moderately prosperous society in all respects. Reform and opening up constitute the most salient feature of the new period. From the countryside to the cities and from the economic to other areas, the process of sweeping reform has unfolded with irresistible momentum. From the coastal areas to areas along the Yangtze River and the borders, and from the eastern to the central and western regions, the door has been resolutely opened to the outside world. This great undertaking of reform and opening up, never seen before in history, has greatly stimulated the enthusiasm of hundreds of millions of Chinese people and brought about China's historic transformation from a highly centralized planned economy to a robust socialist market economy, and from a closed or semi-closed state to all-round opening up. Today socialist China is standing rock-firm in the East, oriented toward modernization, the world and the future. Rapid development represents the most remarkable achievement in the new period. The Party has been implementing the three-step strategy for modernization, leading the people in working hard to promote China's sustained rapid development at a rate rarely seen in the world. China's economy, once on the verge of collapse, has grown to rank as the fourth largest in the world, and its import and export volume, the third biggest. The Chinese people, once inadequately fed and clad, are leading a fairly comfortable life on the whole. The impoverished population in rural areas has dropped from more than 250 million to just over 20 million. The country's achievements in political, cultural and social development have captured world attention. China's development has not only enabled its people to move steadily toward prosperity and happiness, but also contributed substantially to the growth of the world economy and the progress of human civilization. Keeping up with the times is the most prominent hallmark of the new period. Adhering to the Marxist ideological line, the Party has been constantly seeking answers to major theoretical and practical questions such as what socialism is and how to build it, what kind of party we must build and how to build it, and what kind of development China should achieve and how to achieve it. The Party has been constantly adapting Marxism to conditions in China, and adhering to and enriching its own basic theory, line, program and experience. Socialism and Marxism have shown great vitality on Chinese soil, brought more benefits to the people, and enabled the Chinese nation to catch up with the trend of the times in great strides and see the bright future of national rejuvenation. Facts have incontrovertibly proved that the decision to begin reform and opening up is vital to the destiny of contemporary China, that reform and opening up are the only way of developing socialism with Chinese characteristics and rejuvenating the Chinese nation, that only socialism can save China and that only reform and opening up can develop China, socialism and Marxism. As a great new revolution, reform and opening up are not to be plain sailing or be accomplished overnight. Essentially they accord with the aspirations of the Party membership and the people and keep up with the trend of the times. The orientation and path of reform and opening up are entirely correct, and their merits and achievements can never be negated. To stop or reverse reform and opening up would only lead to a blind alley. In the historical course of reform and opening up, the Party has combined adhering to the basic tenets of Marxism with adapting it to Chinese conditions, upholding the Four Cardinal Principles with adhering to the reform and opening up policy, respecting the people's pioneering initiative with strengthening the Party's leadership, adhering to the basic system of socialism with developing the market economy, effecting changes in the economic base with promoting reform of the superstructure, developing the productive forces with improving the cultural and ethical quality of the whole nation, raising efficiency with promoting social equity, pursuing independent development with taking part in economic globalization, promoting reform and development with maintaining social stability, and advancing the great cause of socialism with Chinese characteristics with making progress in the great new undertaking to build the Party. In this course the Party has gained invaluable experience in eliminating poverty, accelerating modernization, and consolidating and developing socialism in a large developing country of over one billion people. To sum up, the fundamental reason behind all our achievements and progress since the reform and opening up policy was introduced is that we have blazed a path of socialism with Chinese characteristics and established a system of theories of socialism with Chinese characteristics. Essentially, to hold high the great banner of socialism with Chinese characteristics means to keep to this path and uphold this system. Taking the path of socialism with Chinese characteristics means we will, under the leadership of the CPC and in light of China's basic conditions, take economic development as the central task, adhere to the Four Cardinal Principles and persevere in reform and opening up, release and develop the productive forces, consolidate and improve the socialist system, develop the socialist market economy, socialist democracy, an advanced socialist culture and a harmonious socialist society, and make China a prosperous, strong, democratic, culturally advanced and harmonious modern socialist country. The main reason this path is completely correct and can lead China to development and progress is that we have adhered to the basic tenets of scientific socialism and in the meantime added to them distinct Chinese characteristics in light of China's conditions and the features of the times. In contemporary China, to stay true to socialism means to keep to the path of socialism with Chinese characteristics. Theories of socialism with Chinese characteristics constitute a system of scientific theories including Deng Xiaoping Theory, the important thought of Three Represents, and the Scientific Outlook on Development and other major strategic thoughts. This system represents the Party's adherence to and development of Marxism-Leninism and Mao Zedong Thought and embodies the wisdom and hard work of several generations of Chinese Communists leading the people in carrying out tireless explorations and practices. It is the latest achievement in adapting Marxism to Chinese conditions, the Party's invaluable political and intellectual asset, and the common ideological foundation for the concerted endeavor of the people of all ethnic groups. It is an open system that keeps developing. Practices since the publication of the Communist Manifesto nearly 160 years ago have proved that only when Marxism is integrated with the conditions of a specific country, advances in step with the times and is tied to the destiny of the people can it demonstrate its strong vitality, creativity and appeal. In contemporary China, to stay true to Marxism means to adhere to the system of theories of socialism with Chinese characteristics. There is no end to practice or innovation. All Party members must cherish the path of socialism with Chinese characteristics and the system of theories of socialism with Chinese characteristics, which the Party explored and created after going through all the hardships, keep to the path and uphold the system for a long time to come and constantly develop them. We must continue to emancipate our minds, seek truth from facts, keep up with the times, make bold changes and innovations, stay away from rigidity or stagnation, fear no risks, never be confused by any interference, broaden our path of socialism with Chinese characteristics, and ensure that the truth of Marxism of contemporary China shines even more brightly. To continue to build a moderately prosperous society in all respects and develop socialism with Chinese characteristics at the new stage of development, we must follow the guidance of Deng Xiaoping Theory and the important thought of Three Represents and thoroughly apply the Scientific Outlook on Development. The Scientific Outlook on Development is a continuation and development of the important thoughts on development advanced by the previous three generations of central collective leadership of the CPC and a concentrated expression of the Marxist world outlook and methodology with regard to development. It is a scientific theory that is in the same line as Marxism-Leninism, Mao Zedong Thought, Deng Xiaoping Theory and the important thought of Three Represents and keeps up with the times. It is an important guiding principle for China's economic and social development and a major strategic thought that we must uphold and apply in developing socialism with Chinese characteristics. In light of the basic reality that China is in the primary stage of socialism, the Scientific Outlook on Development has been formulated to meet new requirements of development by analyzing China's own practice and drawing on the experience of other countries in development. At this new stage in the new century, China's development shows a series of new features which are mainly as follows: The economic strength has increased markedly, but the overall productivity remains low, the capacity for independent innovation is weak, and the longstanding structural problems and the extensive mode of growth are yet to be fundamentally addressed. The socialist market economy is basically in place, but there remain structural and institutional obstacles slowing down development, and further reform in difficult areas is confronted with deep-seated problems. A relatively comfortable standard of living has been achieved for the people as a whole, but the trend of a growing gap in income distribution has not been thoroughly reversed, there are still a considerable number of impoverished and low-income people in both urban and rural areas, and it has become more difficult to accommodate the interests of all sides. Efforts to balance development have yielded remarkable results, but the foundation of agriculture remains weak, the rural areas still lag behind in development, and we face an arduous task to narrow the urban-rural and interregional gaps in development and promote balanced economic and social development. Socialist democracy has continued to develop and we have made steady progress in implementing the rule of law as a fundamental principle, but efforts to improve democracy and the legal system fall somewhat short of the need to expand people's democracy and promote economic and social development, and political restructuring has to be deepened. Socialist culture is thriving as never before, but the people have growing cultural needs and have become more independent, selective, changeable and diverse in thinking, setting higher requirements for the development of an advanced socialist culture. Our society has become evidently more dynamic, but profound changes have taken place in the structure of society, in the way society is organized and in the pattern of social interests, and many new issues have emerged in social development and management. China is opening wider to the outside world, but international competition is becoming increasingly acute, pressure in the form of the economic and scientific dominance of developed countries will continue for a long time to come, both predictable and unpredictable risks are increasing, and the need to balance domestic development and opening to the outside world is greater than ever. All this shows that through the unremitting efforts we have made since the founding of the People's Republic in 1949, particularly since the introduction of the reform and opening up policy, China has scored achievements in development that have captured world attention, and experienced far-reaching changes in the productive forces and the relations of production, as well as in the economic base and the superstructure. However, the basic reality that China is still in the primary stage of socialism and will remain so for a long time to come has not changed, nor has Chinese society's principal contradiction - the one between the ever-growing material and cultural needs of the people and the low level of social production. The current features of development in China are a concrete manifestation of that basic reality at this new stage in the new century. Stressing recognition of the basic reality is not meant to belittle ourselves, wallow in backwardness, or encourage unrealistic pursuit of quick results. Rather, such recognition will serve as the basis of our endeavor to advance reform and plan for development. We must always remain sober-minded, base our efforts on the most significant reality that China is in the primary stage of socialism, scientifically analyze the new opportunities and challenges arising from China's full involvement in economic globalization, fully understand the new situation and tasks in China's advance toward an industrialized, information-based, urbanized, market-oriented and internationalized country, have a good grasp of the new issues and problems we face in development, follow more conscientiously the path of scientific development, and strive to open up a broader vista for developing socialism with Chinese characteristics. The Scientific Outlook on Development takes development as its essence, putting people first as its core, comprehensive, balanced and sustainable development as its basic requirement, and overall consideration as its fundamental approach. - We must regard development as the top priority of the Party in governing and rejuvenating the country. Development is of decisive significance for building a moderately prosperous society in all respects and speeding up socialist modernization. We must firmly commit ourselves to the central task of economic development, concentrate on construction and development, and keep releasing and developing the productive forces. We must better implement the strategy of rejuvenating the country through science and education, the strategy of strengthening the nation with trained personnel and the strategy of sustainable development. We must grasp the law of development, make innovations in our thinking, transform the mode of development, crack hard issues and raise quality and efficiency to achieve sound and rapid development, so that we can lay a solid foundation for developing socialism with Chinese characteristics. We must strive for scientific development by putting people first and making it comprehensive, balanced and sustainable; we must strive for harmonious development by integrating all undertakings and promoting unity and amity among all members of society; and we must strive for peaceful development in the course of which China develops itself by safeguarding world peace and contributes to world peace by developing itself. - We must always put people first. Serving the people wholeheartedly is the fundamental purpose of the Party, and its every endeavor is for the well-being of the people. We must always make sure that the aim and outcome of all the work of the Party and the state is to realize, safeguard and expand the fundamental interests of the overwhelming majority of the people. We must respect the principal position of the people in the country's political life, give play to their creativity, protect their rights and interests, take the path of prosperity for all and promote their all-round development, to ensure that development is for the people, by the people and with the people sharing in its fruits. - We must pursue comprehensive, balanced and sustainable development. In accordance with the overall arrangements for the cause of socialism with Chinese characteristics, we will promote all-round economic, political, cultural and social development, coordinate all links and aspects of our modernization drive, and balance the relations of production with the productive forces and the superstructure with the economic base. We must adopt an enlightened approach to development that results in expanded production, a better life and sound ecological and environmental conditions, and build a resource-conserving and environment-friendly society that coordinates growth rate with the economic structure, quality and efficiency, and harmonizes economic growth with the population, resources and the environment, so that our people will live and work under sound ecological and environmental conditions and our economy and society will develop in a sustainable way. - We must persist in overall consideration. We need to correctly understand and handle the major relationships in the cause of socialism with Chinese characteristics and balance urban and rural development, development among regions, economic and social development, relations between man and nature, and domestic development and opening to the outside world. We must take into overall consideration the relationships between the central and local authorities, between personal and collective interests, between interests of the part and those of the whole, and between immediate and long-term interests, so as to fully arouse the initiative of all sides. We must take both the domestic and international situations into consideration, develop a global and strategic perspective, be good at seizing opportunities for development and coping with risks and challenges in a changing world, and work for a favorable international environment. While planning our work from an overall perspective, we need to work hard to make breakthroughs on the key issues that affect the overall situation and on the major problems that affect public interests. To thoroughly apply the Scientific Outlook on Development, we must work energetically to build a harmonious socialist society. Social harmony is an essential attribute of socialism with Chinese characteristics. Scientific development and social harmony are integral to each other and neither is possible without the other. Building a harmonious socialist society is a historical mission throughout the cause of socialism with Chinese characteristics, as well as a historical process and the social outcome of correctly handling various social problems on the basis of development. It is through development that we will increase the material wealth of society and constantly improve people's lives, and it is again through development that we will guarantee social equity and justice and constantly promote social harmony. To realize social equity and justice is the Chinese Communists' consistent position and a major task of developing socialism with Chinese characteristics. In accordance with the general requirements for democracy and the rule of law, equity and justice, honesty and fraternity, vigor and vitality, stability and order, and harmony between man and nature and the principle of all the people building and sharing a harmonious socialist society, we will spare no effort to solve the most specific problems of the utmost and immediate concern to the people and strive to create a situation in which all people do their best, find their proper places in society and live together in harmony, so as to provide a favorable social environment for development. To thoroughly apply the Scientific Outlook on Development, we must continue to deepen reform and opening up. We need to incorporate the spirit of reform and innovation into all links of governance, unswervingly adhere to the orientation of reform, and have more scientific decision-making and better coordinated measures for reform. We will improve the socialist market economy, promote institutional reform and innovation in various sectors, accelerate reform in important fields and crucial links, improve opening up in all respects and make our systems and mechanisms full of vigor, highly efficient, more open and conducive to scientific development, so as to provide a powerful driving force and an institutional guarantee for developing socialism with Chinese characteristics. We will always take improving people's lives as a pivotal task in balancing reform, development and stability and ensure that our reform always has the endorsement and support of the people. To thoroughly apply the Scientific Outlook on Development, we must strengthen our efforts to build the Party in earnest. As is required by the Party's lofty mission of governing and rejuvenating the nation, our efforts to improve the Party's governance capability and maintain and develop its vanguard nature must serve our task of directing scientific development, promoting social harmony, guiding development and progress in China and better representing and realizing the fundamental interests of the overwhelming majority of the people. In this way, the Party's work and our efforts to build the Party will better meet the requirement of the Scientific Outlook on Development and provide a reliable political and organizational guarantee for scientific development. - Promote balanced development to ensure sound and rapid economic growth. The development pattern will be significantly transformed. We will quadruple the per capita GDP of the year 2000 by 2020 through optimizing the economic structure and improving economic returns while reducing consumption of resources and protecting the environment. The socialist market economy will be improved. We will greatly enhance our capacity for independent innovation, enabling scientific and technological advancement to contribute much more to economic growth and making China an innovative country. The ratio of consumption to GDP will increase steadily, and consumption, investment and export will be coordinated to boost economic growth. A mechanism for urban and rural areas and for different regions to have balanced and interactive development and a layout of development priority zones will be basically in place. Efforts to build a new socialist countryside will make significant headway. The proportion of urban residents will notably increase. - Expand socialist democracy and better safeguard the people's rights and interests as well as social equity and justice. Citizens' participation in political affairs will expand in an orderly way. The rule of law will be carried out more thoroughly as a fundamental principle, public awareness of law will be further enhanced, and fresh progress will be made in government administration based on the rule of law. Primary-level democracy will be improved. The government will markedly enhance its capability of providing basic public services. - Promote cultural development and notably enhance the cultural and ethical quality of the whole nation. Socialist core values will prevail among the people, and fine ideological and ethical trends will be encouraged. A basic system of public cultural services will cover the whole society, the cultural industry will account for much more of the national economy and become more competitive internationally, and a more abundant supply of cultural products will be available to meet the people's needs. - Accelerate the development of social programs and improve every aspect of the people's well-being. The modern system of national education will be further improved, a basic system for lifelong education will be in place, the educational attainment of the whole nation will rise to a much higher level, and the training of innovative personnel will be improved markedly. Employment will be further expanded. A basic system of social security will cover both urban and rural residents so that everyone is assured of basic living standards. A reasonable and orderly pattern of income distribution will be basically in place, with middle-income people making up the majority and absolute poverty basically eliminated. Everyone will have access to basic medical and health services. The system of social management will be further improved. - Promote a conservation culture by basically forming an energy- and resource-efficient and environment-friendly structure of industries, pattern of growth and mode of consumption. We will have a large-scale circular economy and considerably increase the proportion of renewable energy sources in total energy consumption. The discharge of major pollutants will be brought under effective control and the ecological and environmental quality will improve notably. Awareness of conservation will be firmly established in the whole of society. 1. Enhance China's capacity for independent innovation and make China an innovative country. This is the core of our national development strategy and a crucial link in enhancing the overall national strength. We need to keep to the path of independent innovation with Chinese characteristics and improve our capacity for independent innovation in all areas of modernization. We need to conscientiously implement the Outline of the National Program for Long- and Medium-Term Scientific and Technological Development (2006-20), increase spending on independent innovation, and make breakthroughs in key technologies vital to our economic and social development. We will speed up forming a national innovation system and support basic research, research in frontier technology and technological research for public welfare. We will step up our efforts to establish a market-oriented system for technological innovation, in which enterprises play the leading role and which combines the efforts of enterprises, universities and research institutes, and guide and support the concentration of factors of innovation in enterprises, thereby promoting the translation of scientific and technological advances into practical productive forces. We will deepen reform of the system for managing science and technology, optimize the allocation of relevant resources, and improve the legal guarantee, policy system, incentive mechanism and market conditions to encourage technological innovation and the application of scientific and technological achievements in production. We will implement the strategy for intellectual property rights. We will make the best use of international resources of science and technology. We will continue to create conditions conducive to innovation, work to train world-class scientists and leaders in scientific and technological research, attach great importance to training innovative personnel in the frontline of production, inspire the creative wisdom of the whole society and bring forth large numbers of innovative personnel in all areas. 2. Accelerate transformation of the mode of economic development and promote upgrading of the industrial structure. This is a pressing strategic task vital to the national economy as a whole. We must keep to the new path of industrialization with Chinese characteristics, pursue the policy of boosting domestic demand, particularly consumer demand, and propel three transitions in the mode of economic growth: the transition from relying mainly on investment and export to relying on a well coordinated combination of consumption, investment and export, the transition from secondary industry serving as the major driving force to primary, secondary and tertiary industries jointly driving economic growth, and the transition from relying heavily on increased consumption of material resources to relying mainly on advances in science and technology, improvement in the quality of the workforce and innovation in management. We will develop a modern industrial system, integrate IT application with industrialization, push our large industries to grow stronger, invigorate the equipment manufacturing industry, and eliminate outdated production capacities. We will upgrade new- and high-technology industries and develop information, biotechnology, new materials, aerospace, marine and other industries. We will develop the modern service industry and raise the level of the service sector and its share in the economy. We will step up efforts to improve basic industries and infrastructure and accelerate development of a modern energy industry and a comprehensive transport system. We will ensure the quality and safety of products. We will encourage formation of internationally competitive conglomerates. 4. Improve energy, resources, ecological and environmental conservation and enhance China's capacity for sustainable development. Adhering to the basic state policy of conserving resources and the environment is vital to the immediate interests of the people and the survival and development of the Chinese nation. We must give prominence to building a resource-conserving, environment-friendly society in our strategy for industrialization and modernization and get every organization and family to act accordingly. We will improve laws and policies to promote energy, resources, ecological and environmental conservation, and speed up the formation of systems and mechanisms for sustainable development. We will implement the responsibility system for conserving energy and reducing emissions. We will develop and extend advanced and appropriate technologies for conserving, substituting and recycling energy and resources and for controlling pollution, develop clean and renewable energy sources, protect land and water resources and set up a scientific, rational system for using energy and resources more efficiently. We will develop environmental conservation industries. We will increase spending on energy and environmental conservation with the focus on intensifying prevention and control of water, air and soil pollution and improving the living environment for both urban and rural residents. We will improve water conservancy, forestry and grasslands, intensify efforts to bring desertification under control and prevent the spread of stony deserts, and promote restoration of the ecosystems. We will enhance our capacity to respond to climate change and make new contributions to protecting the global climate. 5. Promote balanced development among regions and improve the pattern of land development. To narrow the gap in development among regions, we must work to ensure their equal access to basic public services and guide a rational flow of factors of production between regions. Following the general strategy for regional development, we will continue to carry out large-scale development of the western region, rejuvenate northeast China and other old industrial bases in an all-round way, boost the development of the central region and support the eastern region in taking the lead in development. We will strengthen land planning, improve policies for regional development and adjust the geographical distribution of economic operations in accordance with the requirement to form development priority zones. In compliance with the laws governing the market economy, we will work beyond administrative divisions to form a number of close-knit economic rims and belts that will provide a strong impetus to the development of other areas. In locating major projects, we must give full consideration to supporting development of the central and western regions and encourage the eastern region to help them develop. We will give more support to the development of old revolutionary base areas, ethnic autonomous areas, border areas and poverty-stricken areas. We will help transform the economies of areas where natural resources are exhausted. We will have the special economic zones, the Pudong New Area in Shanghai and the Binhai New Area in Tianjin play a major role in reform, opening up and independent innovation. Taking a path of urbanization with Chinese characteristics, we will promote balanced development of large, medium-sized and small cities and towns on the principle of balancing urban and rural development, ensuring rational distribution, saving land, providing a full range of functions and getting larger cities to help smaller ones. Focusing on increasing the overall carrying capacity of cities, we will form city clusters with mega cities as the core so that they can boost development in other areas and become new poles of economic growth. 6. Improve the basic economic system and the modern market system. We need to uphold and improve the basic economic system in which public ownership is dominant and different economic sectors develop side by side, unwaveringly consolidate and develop the public sector of the economy, unswervingly encourage, support and guide the development of the non-public sector, ensure equal protection of property rights, and create a new situation in which all economic sectors compete on an equal footing and reinforce each other. We will deepen the reform to introduce the corporate and shareholding systems in state-owned enterprises, improve the modern corporate structure and optimize the distribution and structure of the state sector of the economy to enhance its dynamism, dominance and influence. We will deepen the reform of monopoly industries by introducing competition, and strengthen government regulation and public oversight of them. We will accelerate development of a budget system for managing state capital and improve systems and regulations for managing all types of state assets. We will press ahead with the reform of collectively-owned enterprises and develop various forms of collective and cooperative economic operations. We will promote equitable market access, improve the financing environment and remove institutional barriers in order to promote development of individually-owned businesses and private companies as well as small and medium-sized enterprises. We will develop the economic sector of mixed ownership based on the modern system of property rights. We will accelerate the formation of a modern market system that is unified and open and that allows orderly competition, develop markets for factors of production, improve the pricing mechanism for factors of production and resources to reflect changes in market supply and demand, resource scarcities and environmental costs, regulate and develop industry associations and market-based intermediaries, and improve the social credibility system. 7. Deepen fiscal, taxation and financial restructuring and improve macroeconomic regulation. We will improve the public finance system as we work to ensure equal access to basic public services and establish development priority zones. We need to deepen reform of the budget system, tighten budgetary management and oversight, improve the system whereby both the central and local governments have financial resources proportionate to their duties and responsibilities, accelerate the establishment of a unified, standardized and transparent system for transfer payments, enlarge the size and proportion of general transfer payments, and increase input in public services. We will improve fiscal systems at and below the provincial level to enhance the capacity of county and township governments to provide public services. We will adopt fiscal and taxation systems conducive to scientific development and set up sound compensation systems for use of resources and for damage to the ecological environment. We will proceed with financial reforms to develop various types of financial markets and build a modern financial system that is inclusive of different forms of ownership and different ways of operation and that features a reasonable structure, complete functions, efficiency and security. We will make our banking, securities and insurance industries more competitive. We will improve the structure of the capital market and raise the proportion of direct financing through multiple channels. We will strengthen financial supervision and control, and forestall and defuse financial risks. We will improve the RMB exchange rate regime and gradually make the RMB convertible under capital accounts. We will deepen reform of the investment system and improve and strictly enforce market access rules. We will improve the state planning system. We will give play to the guiding role of national development plans, programs and industrial policies in macroeconomic regulation and combine the use of fiscal and monetary policies to improve macroeconomic regulation. 8. Expand opening up in scope and depth and improve our open economy. Adhering to the basic state policy of opening up, we will better integrate our "bring in" and "go global" strategies, expand the areas of opening up, optimize its structure, raise its quality, and turn our open economy into one in which domestic development and opening to the outside world interact and Chinese businesses and their foreign counterparts engage in win-win cooperation, and one that features security and efficiency, in order to gain new advantages for China in international economic cooperation and competition amid economic globalization. We will deepen the opening up of coastal areas, accelerate that of inland areas and upgrade that of border areas, so that opening up at home and opening to the outside world will promote each other. We will expedite transformation of the growth mode of foreign trade, stress quality, adjust the mix of imports and exports, promote transformation and upgrading of processing trade, and energetically develop service trade. We will make innovations in the way of using foreign capital, improve the structure of foreign investment utilized, and let the use of foreign capital play a positive role in facilitating independent innovation, industrial upgrading and balanced development among regions. We will make innovations in our way of overseas investment and cooperation, support domestic enterprises in carrying out international operations of R&D, production and marketing, and accelerate the growth of Chinese multinational corporations and Chinese brand names in the world market. We will vigorously carry out mutually beneficial international cooperation in energy and resources. We will implement a strategy of free trade zones and expand bilateral and multilateral trade and economic cooperation. We will adopt comprehensive measures to maintain a basic equilibrium in the balance of payments. We must guard against international economic risks. People's democracy is the lifeblood of socialism. The Party has been consistently pursuing the goal of developing socialist democracy. Since China began its reform and opening up, we have made vigorous yet steady efforts to promote political restructuring, and socialist democracy has demonstrated greater vitality in the country. As an important part of the overall reform, political restructuring must be constantly deepened along with economic and social development to adapt to the growing enthusiasm of the people for participation in political affairs. We must keep to the path of political development under socialism with Chinese characteristics, and integrate the leadership of the Party, the position of the people as masters of the country, and the rule of law. We must uphold and improve the system of people's congresses, the system of multiparty cooperation and political consultation under the leadership of the CPC, the system of regional ethnic autonomy, and the system of self-governance at the primary level of society. All this will promote continuous self-improvement and development of the socialist political system. In deepening political restructuring, we must keep to the correct political orientation. On the basis of ensuring the people's position as masters of the country, we will expand socialist democracy, build a socialist country under the rule of law and develop socialist political civilization to enhance the vitality of the Party and the state and arouse the initiative of the people. We must uphold the Party's role as the core of leadership in directing the overall situation and coordinating the efforts of all quarters, and improve its capacity for scientific, democratic and law-based governance to ensure that the Party leads the people in effectively governing the country. We must ensure that all power of the state belongs to the people, expand the citizens' orderly participation in political affairs at each level and in every field, and mobilize and organize the people as extensively as possible to manage state and social affairs as well as economic and cultural programs in accordance with the law. We must uphold the rule of law as a fundamental principle and adopt the socialist concept of law-based governance to ensure that all work of the state is based on the law and that the legitimate rights and interests of citizens are safeguarded. We must maintain the features and advantages of the socialist political system and define institutions, standards and procedures for socialist democracy to provide political and legal guarantees of lasting stability for the Party and the country. 1. Expand people's democracy and ensure that they are masters of the country. The essence and core of socialist democracy are that the people are masters of the country. We need to improve institutions for democracy, diversify its forms and expand its channels, and we need to carry out democratic election, decision-making, administration and oversight in accordance with the law to guarantee the people's rights to be informed, to participate, to be heard, and to oversee. We must support people's congresses in performing their functions pursuant to law and effectively turn the Party's propositions into the will of the state through legal procedures. We must ensure that deputies to people's congresses exercise their functions and powers in accordance with the law and maintain close ties with the general public. We propose that both urban and rural areas gradually adopt the same ratio of deputies to the represented population in elections of deputies to people's congresses. We must strengthen the institutions of standing committees of people's congresses and improve their membership composition in terms of intellectual background and age. We will support the Chinese People's Political Consultative Conference (CPPCC) in performing its functions centered on the two major themes of unity and democracy and improve the system of political consultation, democratic oversight, and participation in the deliberation and administration of state affairs. We will incorporate political consultation in decision-making procedures, improve democratic oversight and ensure that the CPPCC participates in the deliberation and administration of state affairs more effectively. The CPPCC is encouraged to improve itself and play its important role in coordinating relations, pooling strengths, making proposals and serving the overall interests of the country. We must ensure equality among all ethnic groups and guarantee the right of ethnic autonomous areas to exercise autonomy pursuant to law. To ensure scientific and democratic decision-making, we will improve the information and intellectual support for it, increase its transparency and expand public participation in it. In principle, public hearings must be held for the formulation of laws, regulations and policies that bear closely on the interests of the public. We need to step up education about citizenship and establish socialist concepts of democracy, the rule of law, freedom, equality, equity and justice. We support trade unions, the Communist Youth League, women's federations and other people's organizations in functioning in accordance with the law and their respective charters, participating in social management and public services and helping protect the people's legitimate rights and interests. 2. Develop primary-level democracy and ensure that the people enjoy democratic rights in a more extensive and practical way. The most effective and extensive way for the people to be masters of the country is that they directly exercise their democratic rights in accordance with the law to manage public affairs and public service programs at the primary level, practice self-management, self-service, self-education and self-oversight, and exercise democratic oversight over cadres. Such practices must be emphasized and promoted as the groundwork for developing socialist democracy. We need to improve the dynamic mechanism of people's self-governance at the primary level under the leadership of primary Party organizations, expand the scope of self-governance, and improve the institution for democratic management, with a view to turning urban and rural neighborhoods into communities of social life that are well managed, supported by complete services, and filled with civility and harmony. We must rely wholeheartedly on the working class, improve the democratic management system in enterprises and public institutions with workers' conferences as its basic form and increase transparency in factory affairs to support workers' participation in management and to safeguard their legitimate rights and interests. We need to deepen institutional reforms at the town and township level to strengthen government authorities there and improve the systems for transparency in government and village affairs to bring about effective connection and beneficial interaction between government administration and primary-level self-governance. We also encourage social organizations to help expand the participation by the public and report on their petitions to improve the self-governance capability of society. 3. Comprehensively implement the rule of law as a fundamental principle and speed up the building of a socialist country under the rule of law. The rule of law constitutes the essential requirement of socialist democracy. We must persist in scientific and democratic legislation to improve the socialist law system with Chinese characteristics. We will strengthen the enforcement of the Constitution and laws, ensure that all citizens are equal before the law, and safeguard social equity and justice and the consistency, sanctity and authority of the socialist legal system. We need to carry out government administration in accordance with the law. We need to deepen the reform of the judiciary system, optimize the distribution of judicial functions and powers, standardize judicial practices, and build a fair, efficient and authoritative socialist judiciary system to ensure that courts and procuratorates exercise their respective powers independently and impartially in accordance with the law. We need to improve the overall quality of judicial, procuratorial and public security personnel to ensure that law enforcement is strict, impartial and civilized. We need to step up the education campaign to increase public awareness of law, and promote the spirit of the rule of law, creating a social environment in which people study, abide by and apply laws of their own accord. We must respect and safeguard human rights, and ensure the equal right to participation and development for all members of society in accordance with the law. Party organizations at all levels and all Party members must act under the Constitution and laws on their own initiative and take the lead in upholding the authority of the Constitution and laws. 4. Expand the patriotic united front and unite with all forces that can be united. Promoting harmony in relations between political parties, between ethnic groups, between religions, between social strata, and between our compatriots at home and overseas plays an irreplaceable role in enhancing unity and pooling strengths. Acting on the principle of long-term coexistence, mutual oversight, sincerity, and sharing of both good and bad times, we will strengthen our cooperation with the democratic parties, support them and personages without party affiliation in better performing their functions of participation in the deliberation and administration of state affairs and democratic oversight, and select and recommend a greater number of outstanding non-CPC persons for leading positions. Keeping in mind the objective of all ethnic groups working together for common prosperity and development, we must guarantee the legitimate rights and interests of ethnic minorities, and strengthen and develop socialist ethnic relations based on equality, solidarity, mutual assistance and harmony. We will fully implement the Party's basic principle for its work related to religious affairs and bring into play the positive role of religious personages and believers in promoting economic and social development. We encourage members of emerging social strata to take an active part in building socialism with Chinese characteristics. We will conscientiously follow the Party's policy on overseas Chinese affairs and support overseas Chinese nationals, returned overseas Chinese and their relatives in caring about and participating in the modernization drive and the great cause of peaceful reunification of the motherland. 5. Accelerate the reform of the administrative system and build a service-oriented government. The administrative reform is an important part of the efforts to deepen China's overall reform. We must lose no time in working out a master plan for it, with the focus on changing functions, straightening out relations, optimizing the setup and raising efficiency, and bring about a system which matches powers with responsibilities, divides work in a rational way, fosters scientific decision-making, and ensures smooth enforcement and effective oversight. We need to improve the government responsibility system and the public service system, promote e-government and strengthen social management and public services. We will accelerate the separation of the functions of the government from those of enterprises, state assets management authorities, public institutions and market-based intermediaries, standardize administrative practices, strengthen administrative law-enforcement agencies, reduce the number of matters requiring administrative examination and approval and standardize such procedures, and reduce government intervention in microeconomic operations. We will standardize the relationship between local departments directly under central government organs and local governments. We will step up our efforts to streamline government organs, explore ways to establish greater departments with integrated functions, and improve the mechanism of coordination and collaboration between government departments. We will downsize and standardize various organs for deliberation and coordination and their working offices, cut down levels of administration, minimize its costs, and address the problems of overlapping organizations and functions and conflicting policies from different departments. We will give overall consideration to the setup of Party committees and governments as well as that of people's congresses and CPPCC committees, reduce the number of their leading positions and strictly control their staffing. We will step up the restructuring of different categories of public institutions. 6. Improve the mechanism of restraint and oversight and ensure that power entrusted by the people is always exercised in their interests. Power must be exercised in the sunshine to ensure that it is exercised correctly. We must have institutions to govern power, work and personnel, and establish a sound structure of power and a mechanism for its operation in which decision-making, enforcement and oversight powers check each other and function in coordination. We will improve organic laws and rules of procedure to ensure that state organs exercise their powers and perform their functions and responsibilities within their statutory jurisdiction and in accordance with legal procedures. We will improve the open administrative system in various areas and increase transparency in government work, thus enhancing the people's trust in the government. We will focus on tightening oversight over leading cadres and especially principal ones, over the management and use of human, financial and material resources, and over key positions. We will improve the systems of inquiries, accountability, economic responsibility auditing, resignation and recall. We will implement the intra-Party oversight regulations, strengthen democratic oversight and give scope to the oversight role of public opinion, pooling forces of oversight from all sides to make it more effective. Democracy will keep developing along with the progress of socialism. In the historical course of developing socialism with Chinese characteristics, Chinese Communists and the Chinese people will surely advance socialist democracy that is full of vitality. In the present era, culture has become a more and more important source of national cohesion and creativity and a factor of growing significance in the competition in overall national strength, and the Chinese people have an increasingly ardent desire for a richer cultural life. We must keep to the orientation of advanced socialist culture, bring about a new upsurge in socialist cultural development, stimulate the cultural creativity of the whole nation, and enhance culture as part of the soft power of our country to better guarantee the people's basic cultural rights and interests, enrich the cultural life in Chinese society and inspire the enthusiasm of the people for progress. 1. Build up the system of socialist core values and make socialist ideology more attractive and cohesive. The system of socialist core values represents the essence of socialist ideology. We must consolidate the guiding position of Marxism, persistently arm the whole Party with and educate the people in the latest achievements in adapting Marxism to Chinese conditions, rally the people with our common ideal of socialism with Chinese characteristics, inspire the people with patriotism-centered national spirit and with the spirit of the times centering on reform and innovation, guide social ethos with the socialist maxims of honor and disgrace, and solidify the common ideological basis of the joint endeavor of the whole Party and the people of all ethnic groups. We will make every effort to carry out theoretical innovation and give Marxism of contemporary China distinct characters of practice, of the Chinese nation and of the times. We will publicize the theories of socialism with Chinese characteristics, and take Marxism of contemporary China to the general public. We will carry on the Project to Study and Develop Marxist Theory to provide in-depth answers to major theoretical and practical questions and to bring up a group of Marxist theoreticians, especially young and middle-aged ones. We will incorporate the socialist core values into all stages of national education and the entire process of cultural and ethical progress to make them the targets pursued by the people of their own accord. We will explore effective ways of letting the system of socialist core values guide trends of thought and take the initiative in ideological work, respecting divergence and allowing diversity while effectively resisting the influence of erroneous and decadent ideas. We will develop philosophy and social sciences, promoting innovation in academic disciplines, academic viewpoints and research methods. We encourage people working in these fields to serve as a think tank for the cause of the Party and the people, and we will introduce related outstanding achievements and distinguished scholars to the world arena. 2. Foster a culture of harmony and cultivate civilized practices. A culture of harmony provides important intellectual support for the unity and progress of all our people. We must step up the development of the press, publishing, radio, film, television, literature and art, give correct guidance to the public and foster healthy social trends. We must balance cultural development between urban and rural areas and among different regions, focusing on enriching the cultural life in rural and remote areas and of rural migrant workers in cities. We will strengthen efforts to develop and manage Internet culture and foster a good cyber environment. We will promote patriotism, collectivism and socialist ideology. With the emphasis on enhancing people's awareness of integrity, we will promote social ethics, professional codes of conduct, family virtues and individual morality, let paragons of virtue serve as role models for society, and guide people in conscientiously carrying out legal obligations and social and family responsibilities. We will strengthen and improve our ideological and political work, paying attention to compassionate care and psychological counseling and correctly handling interpersonal relations. We will mobilize all sectors of society in doing a good job of ideological and moral education among young people and create a favorable environment for their healthy development. We will carry out intensive activities to promote cultural and ethical progress among the public, improve the system of voluntary public services, and encourage practices such as upholding gender equality, respecting the elderly, caring for the young, showing concern for and helping each other and coming to the rescue of others even at risk to oneself. We will promote the scientific spirit and spread scientific knowledge. We will launch extensive public fitness programs and ensure the success of the 2008 Olympic Games and the Paralympics in Beijing and the 2010 World Exposition in Shanghai. 3. Promote Chinese culture and build the common spiritual home for the Chinese nation. Chinese culture has been an unfailing driving force for the Chinese nation to keep its unity and make progress from generation to generation. We must have a comprehensive understanding of traditional Chinese culture, keep its essence and discard its dross to enable it to fit in with present-day society, stay in harmony with modern civilization, keep its national character and reflect changes of the times. We will further publicize the fine traditions of Chinese culture and use modern means of science and technology to exploit the rich resources of our national culture. We will explore and better protect the cultures of all ethnic groups, attach great importance to the protection of cultural relics and intangible cultural heritage and do a good job collating ancient books and records. We will also strengthen international cultural exchanges to draw on the fine achievements of foreign cultures and enhance the influence of Chinese culture worldwide. 4. Stimulate cultural innovation and enhance the vitality of cultural development. The only way to invigorate culture is to promote innovation in its content and form, its structure and mechanism, and its means of dissemination from the high starting point of our times and release and develop its productive forces. We must keep to the orientation of serving the people and socialism, uphold the principle of letting a hundred flowers blossom and a hundred schools of thought contend, and maintain close contact with reality, life and the public. We must always give top priority to social benefits and try to ensure both good economic returns and social benefits. We must create more excellent, popular works that reflect the people's principal position in the country and their real life. We must deepen cultural restructuring and improve the policies for supporting nonprofit cultural programs, developing the cultural industry and encouraging cultural innovation, so as to create favorable conditions for producing fine works, outstanding personnel and good results. We must continue to develop nonprofit cultural programs as the main approach to ensuring the basic cultural rights and interests of the people, increase spending on such programs, and build more cultural facilities in urban communities and rural areas. We must vigorously develop the cultural industry, launch major projects to lead the industry as a whole, speed up development of cultural industry bases and clusters of cultural industries with regional features, nurture key enterprises and strategic investors, create a thriving cultural market and enhance the industry's international competitiveness. We will use new and high technology to create new ways of producing cultural works, foster new forms of operation in the cultural industry and accelerate the establishment of a dissemination system featuring fast communication and wide coverage. We will establish a national system of honors for outstanding cultural workers. The great rejuvenation of the Chinese nation will definitely be accompanied by the thriving of Chinese culture. We will give full scope to the principal position of the people in cultural development, arouse the enthusiasm of cultural workers, promote vigorous development and prosperity of culture more conscientiously and actively, and create cultural works in the great practice of socialism with Chinese characteristics, so that the people will share in the benefits of cultural development. Social development is closely related to the people's well-being. More importance must therefore be attached to social development on the basis of economic growth to ensure and improve people's livelihood, carry out social restructuring, expand public services, improve social management and promote social equity and justice. We must do our best to ensure that all our people enjoy their rights to education, employment, medical and old-age care, and housing, so as to build a harmonious society. 1. Give priority to education and turn China into a country rich in human resources. Education is the cornerstone of national rejuvenation, and equal access to education provides an important underpinning for social equity. We must implement the Party's educational policy to the letter, focus on educating students with top priority given to cultivating their moral integrity, improve their overall quality, modernize the educational system, and train socialist builders and successors who have all-round attainments in moral, intellectual, physical and aesthetic education. All this is designed to run education to the satisfaction of the people. We will optimize the educational structure, promote balanced development of compulsory education, move faster toward universal access to senior secondary education, vigorously develop vocational education, and improve the quality of higher education. We will also attach importance to pre-school education and care about special education. We will update our views on education and deepen reform in curricula, modes of instruction, the systems of examination and enrollment, and the system for evaluating educational quality. We will ease the study load of primary and secondary school students and improve their overall quality. We will continue to run education on a nonprofit basis, increase government spending on education, regulate the collection of education-related fees, support the development of education in poverty-stricken and ethnic autonomous areas, improve the system of financial aid to students, and ensure that children from poor families and of rural migrant workers in cities enjoy equal access to compulsory education as other children. We will build up the ranks of teachers, with the emphasis on improving the quality of teachers in rural areas. We will encourage and regulate educational programs run by nongovernmental sectors. Distance learning and continuing education will be promoted to make ours a society in which every citizen is committed to learning and pursues lifelong learning. 2. Implement a development strategy that promotes job creation and encourage entrepreneurship to create more employment opportunities. Employment is vital to people's livelihood. We will continue to follow a proactive employment policy, strengthen government guidance, improve the market mechanism for employment, create more jobs and improve the employment structure. We will improve policies to encourage people to start businesses or find jobs on their own and promote a healthy attitude toward employment so that more people in the labor force will launch their own businesses. We will improve vocational education and training for the labor force and intensify pre-employment training for surplus labor transferred from rural areas. We will establish a unified, standardized labor market and a mechanism that ensures equal employment opportunities for both urban and rural residents. We will improve employment assistance to the needy and make it a priority to help zero-employment families to have job opportunities. We will do our best to help college graduates find jobs. We will regulate and coordinate labor relations, improve and implement government policies concerning rural migrant workers in cities, and protect the rights and interests of every worker in accordance with the law. 3. Deepen reform of the income distribution system and increase the income of urban and rural residents. Equitable income distribution is an important indication of social equity. We will adhere to and improve the system whereby distribution according to work remains the predominant mode and coexists with various other modes. We will improve the distribution system to allow factors of production such as labor, capital, technology and managerial expertise to have a rightful share according to their respective contribution. A proper balance will be struck between efficiency and equity in both primary distribution and redistribution, with particular emphasis on equity in redistribution. We will gradually increase the share of personal income in the distribution of national income, and raise that of work remuneration in primary distribution. Vigorous efforts will be made to raise the income of low-income groups, gradually increase poverty-alleviation aid and the minimum wage, and set up a mechanism of regular pay increases for enterprise employees and a mechanism for guaranteeing payment of their salaries. Conditions will be created to enable more citizens to have property income. We will protect lawful incomes, regulate excessively high incomes and ban illegal gains. We will increase transfer payments, intensify the regulation of incomes through taxation, break business monopolies, create equal opportunities, and overhaul income distribution practices with a view to gradually reversing the growing income disparity. 4. Accelerate the establishment of a social security system covering both urban and rural residents and guarantee their basic living conditions. Social security is an important guarantee of social stability. We will step up the building of a sound social security system that is based on social insurance, assistance and welfare, with basic old-age pension, basic medical care and subsistence allowances as its backbone, and supplemented by charity and commercial insurance. We will promote reform of basic old-age insurance systems in enterprises, Party and government organs and public institutions and explore ways to set up an old-age insurance system in rural areas. We will promote the development of basic medical insurance systems for urban workers and residents and a new type of cooperative medical care system in rural areas. We will improve the system of subsistence allowances for both urban and rural residents and gradually increase such allowances. We will improve the systems of unemployment, workers' compensation and maternity insurances. We will upgrade management of social security funds to higher-level authorities and work out unified methods for transferring social security accounts nationwide. We will provide more social security funds through various means and strengthen their oversight and management to maintain and increase their value. We will improve social assistance. We will do a good job providing special assistance to families of martyrs and servicemen and helping demobilized military personnel return to civilian life. We will promote programs for the disabled in a humanitarian spirit. We will develop more programs for the elderly. We will intensify our efforts in disaster prevention and reduction. We will improve the low-rent housing system and speed up resolution of the housing difficulties of low-income families in urban areas. 5. Establish a basic medical and health care system and improve the health of the whole nation. Health provides the foundation for people's all-round development and has a direct bearing on the happiness of each family. We must maintain the public welfare nature of public medical and health care services, always put disease prevention first, center on rural areas and attach equal importance to traditional Chinese medicine and Western medicine. We will separate government administration from medical institutions, management from operation, medical care from pharmaceuticals, and for-profit from nonprofit operations. We will increase government responsibilities and spending, improve the national health policy, and encourage greater participation of nongovernmental sectors so as to develop systems of public health services, medical services, medical security and medicine supply to provide both urban and rural residents with safe, effective, convenient and affordable medical and health services. We will improve the system to prevent and control the outbreak of major diseases and enhance our capacity to respond to public health emergencies. We will improve the three-tier rural health care network spanning the county, township and village and the urban community-based health care system, and deepen reform of public hospitals. We will set up a national system for basic pharmaceuticals to ensure their supply. We will support the development of traditional Chinese medicine and the folk medicines of ethnic minorities. We will work harder to improve the professional ethics and style of work of health workers and the quality of medical services. We must ensure food and drug safety. We will adhere to the basic state policy of family planning, keep the birthrate low and make the newborns healthier. We will launch patriotic sanitation campaigns and develop health care programs for women and children. 6. Improve social management and safeguard social stability and unity. Social stability is the common aspiration of the people and an important prerequisite for reform and development. We need to improve the structure of social management comprising Party committee leadership, government responsibility, nongovernmental support and public participation, and improve the system of social management at the primary level. We will stimulate the creativity of society to the greatest extent, maximize factors conducive to harmony and minimize those detrimental to it. We will properly handle contradictions among the people, improve the system for handling complaints in the form of letters and visits from the public, and strengthen the mechanism for safeguarding the rights and interests of the people in which the Party and the government play the leading role. We will attach importance to the development and management of social organizations. We will improve services for and management of the floating population. We must ensure safe development by strengthening management and oversight of work safety and taking effective measures to prevent serious or exceptionally serious accidents. We will improve the mechanism of emergency management. We will improve the crime prevention and control system, maintain law and order through comprehensive measures, launch intensive campaigns to ensure public security, reform and step up community policing in both urban and rural areas, and prevent and crack down on crime in accordance with the law to protect people's lives and property. We will improve the strategy and mechanism for national security, and keep high vigilance against and resolutely forestall separatist, infiltrative and subversive activities in various forms to safeguard national security. It requires joint efforts of the whole society to build a harmonious society. We must therefore rely firmly on the people and mobilize all positive factors to create a lively situation in which everyone is duty-bound to work for and benefits from social harmony. To strengthen national defense and the armed forces occupies an important place in the overall arrangements for the cause of socialism with Chinese characteristics. Bearing in mind the overall strategic interests of national security and development, we must take both economic and national defense development into consideration and make our country prosperous and our armed forces powerful while building a moderately prosperous society in all respects. For the armed forces to fully carry out the historical missions assigned by the Party and the people at this new stage in the new century, we must always follow the guidance of Mao Zedong's military thinking, Deng Xiaoping's thinking on building the armed forces in the new period and Jiang Zemin's thinking on building national defense and the armed forces, and take the Scientific Outlook on Development as an important guiding principle for strengthening national defense and the armed forces. We must implement the military strategy for the new period, accelerate the revolution in military affairs with Chinese characteristics, ensure military preparedness, and enhance the military's capability to respond to various security threats and accomplish diverse military tasks. We are determined to safeguard China's sovereignty, security and territorial integrity and help maintain world peace. To make the armed forces more revolutionary, modernized and standardized is an integrated endeavor, and balanced progress must be made in all the three aspects. We must always adhere to the fundamental principle of the Party exercising absolute leadership over the armed forces and the fundamental purpose of the armed forces serving the people. We will educate the military in its historical missions, ideals, beliefs, combat-ready spirit and the socialist maxims of honor and disgrace, and ensure that it carries forward its fine traditions of following the Party's orders, serving the people and fighting valiantly and skillfully. We must build strong armed forces through science and technology. To attain the strategic objective of building computerized armed forces and winning IT-based warfare, we will accelerate composite development of mechanization and computerization, carry out military training under IT-based conditions, modernize every aspect of logistics, intensify our efforts to train a new type of high-caliber military personnel in large numbers and change the mode of generating combat capabilities. We must run the armed forces in accordance with the law, enforce strict discipline, improve relevant laws and regulations and strengthen scientific management. In keeping with the new trends in world military affairs and the new requirements of China's development, we must promote innovation in military theory, technology, organization and management. We will adjust and reform the structure, staffing, policies and institutions of the armed forces to gradually develop a complete set of scientific modes of organization, institutions and ways of operation with Chinese characteristics and in conformity with the laws governing the development of modern armed forces. We will adjust and reform the systems of defense-related science, technology and industry and of weapons and equipment procurement, and enhance our capacity for independent innovation in R&D of weapons and equipment with better quality and cost-effectiveness. We will establish sound systems of weapons and equipment research and manufacturing, military personnel training and logistics that integrate military with civilian purposes and combine military efforts with civilian support, build the armed forces through diligence and thrift, and blaze a path of development with Chinese characteristics featuring military and civilian integration. We will enrich and develop military sciences by carefully studying the features and laws of building and running the armed forces and the strategies and tactics for people's war under the new historical conditions. We will raise the people's awareness of national defense, strengthen national defense mobilization by improving the mobilization system, and enhance the quality of the reserves and the militia. We will strengthen the People's Armed Police so that it can better fulfill its duties of safeguarding national security and social stability and ensuring that the people live and work in peace. We must ensure that the government and the people support the military and give preferential treatment to the families of servicemen and martyrs, and that the military supports the government and cherishes the people. We will energetically encourage the military and the people to work together to promote cultural and ethical progress, and consolidate the solidarity between the military and the government and between the military and the people. Party organizations and governments at all levels and the general public will, as always, support efforts to strengthen national defense and the armed forces, and the military will continue to contribute to economic and social development. Since the return of Hong Kong and Macao to the motherland, more and more experience has been gained in putting into practice the principle of "one country, two systems." The principle is perfectly correct and full of vigor. To realize China's peaceful reunification on this principle accords with the fundamental interests of the Chinese nation. A major task the Party faces in running the country in the new circumstances is to ensure long-term prosperity and stability in Hong Kong and Macao. We will unswervingly implement the principle of "one country, two systems," under which Hong Kong people administer Hong Kong and Macao people administer Macao with a high degree of autonomy, and act in strict accordance with the basic laws of the two special administrative regions. We will render full support to the governments of the two regions in their administration in accordance with the law and in their efforts to promote economic growth, improve people's lives and advance democracy. We encourage people from all walks of life in Hong Kong and Macao to work with one accord to promote social amity under the banner of love for the motherland and devotion to their respective regions. We will increase exchanges and cooperation between the mainland and the two regions so that they can draw on each other's strengths and develop side by side. We will actively support the two regions in their external exchanges and firmly oppose attempts by any external force to interfere in their affairs. Our compatriots in Hong Kong and Macao, without doubt, have the wisdom and ability to successfully administer and develop their regions. Both regions have played and will continue to play an important role in China's modernization drive, and the great motherland will always provide them with strong backing for their prosperity and stability. To resolve the Taiwan question and achieve complete national reunification is a common aspiration of all sons and daughters of the Chinese nation. We will uphold the principle of "peaceful reunification and one country, two systems" and the eight-point proposal for developing the relations between the two sides of the Taiwan Straits and advancing the process of peaceful national reunification in the present stage. We will never waver in our commitment to the one-China principle, never abandon our efforts to achieve peaceful reunification, never change the policy of placing our hopes on the people in Taiwan and never compromise in our opposition to the secessionist activities aimed at "Taiwan independence." With a firm grasp of the theme of peaceful development of cross-Straits relations, we will sincerely work for the well-being of our compatriots on both sides of the Straits and for peace in the Taiwan Straits region, and safeguard China's sovereignty and territorial integrity and the fundamental interests of the Chinese nation. Upholding the one-China principle constitutes the political basis for peaceful development of cross-Straits relations. Although the mainland and Taiwan are yet to be reunified, the fact that they belong to one and the same China has never changed. China is the common homeland for the compatriots on both sides of the Straits, who have every reason to join hands to safeguard and develop this homeland. We are ready to conduct exchanges, dialogue, consultations and negotiations with any political party in Taiwan on any issue as long as it recognizes that both sides of the Straits belong to one and the same China. Here we would like to make a solemn appeal: On the basis of the one-China principle, let us discuss a formal end to the state of hostility between the two sides, reach a peace agreement, construct a framework for peaceful development of cross-Straits relations, and thus usher in a new phase of peaceful development. The 1.3 billion people on the mainland and the 23 million people in Taiwan are of the same blood and share a common destiny. We will make every effort to achieve anything that serves the interests of our Taiwan compatriots, contributes to the maintenance of peace in the Taiwan Straits region, and facilitates peaceful national reunification. We understand, trust and care about our compatriots in Taiwan, and we will, therefore, continue to implement and enrich the policies and measures that benefit them, protect their legitimate rights and interests in accordance with the law, and support economic development on the west shore of the Straits in Fujian Province and in other areas where Taiwan investment is concentrated. The compatriots on both sides of the Straits need to increase contacts, strengthen economic and cultural exchanges in more areas and at higher levels and push for the resumption of direct links of mail, transport and trade, so that they will develop greater empathy and closer cooperation and work together for the great rejuvenation of the Chinese nation. At present, the forces for "Taiwan independence" are stepping up their secessionist activities, seriously jeopardizing the peaceful development of cross-Straits relations. The compatriots on both sides need to work together to oppose and contain such activities. China's sovereignty and territorial integrity brook no division, and any matter in this regard must be decided by the entire Chinese people including our Taiwan compatriots. We are willing to make every effort with the utmost sincerity to achieve peaceful reunification of the two sides, and will never allow anyone to separate Taiwan from the motherland in any name or by any means. The two sides of the Straits are bound to be reunified in the course of the great rejuvenation of the Chinese nation. With close solidarity and concerted efforts of all Chinese people at home and overseas, the complete reunification of the motherland will surely be achieved. The world today is undergoing tremendous changes and adjustments. Peace and development remain the main themes of the present era, and pursuit of peace, development and cooperation has become an irresistible trend of the times. The progress toward a multipolar world is irreversible, economic globalization is developing in depth, and the scientific and technological revolution is gathering momentum. Global and regional cooperation is in full swing, and countries are increasingly interdependent. The international balance of power is changing in favor of the maintenance of world peace, and the overall international situation is stable. At the same time, the world remains far from tranquil. Hegemonism and power politics still exist, local conflicts and hotspot issues keep emerging, imbalances in the world economy are worsening, the North-South gap is widening, and traditional and nontraditional threats to security are intertwined. All this poses difficulties and challenges to world peace and development. Sharing opportunities for development and rising to challenges together so as to further the noble cause of peace and development of humanity bear on the fundamental interests of the people of all countries and meet their common aspirations. We maintain that the people of all countries should join hands and strive to build a harmonious world of lasting peace and common prosperity. To this end, all countries should uphold the purposes and principles of the United Nations Charter, observe international law and universally recognized norms of international relations, and promote democracy, harmony, collaboration and win-win solutions in international relations. Politically, all countries should respect each other and conduct consultations on an equal footing in a common endeavor to promote democracy in international relations. Economically, they should cooperate with each other, draw on each other's strengths and work together to advance economic globalization in the direction of balanced development, shared benefits and win-win progress. Culturally, they should learn from each other in the spirit of seeking common ground while shelving differences, respect the diversity of the world, and make joint efforts to advance human civilization. In the area of security, they should trust each other, strengthen cooperation, settle international disputes by peaceful means rather than by war, and work together to safeguard peace and stability in the world. On environmental issues, they should assist and cooperate with each other in conservation efforts to take good care of the Earth, the only home of human beings. Historic changes have occurred in the relations between contemporary China and the rest of the world, resulting in ever closer interconnection between China's future and destiny and those of the world. Whatever changes take place in the international situation, the Chinese government and people will always hold high the banner of peace, development and cooperation, pursue an independent foreign policy of peace, safeguard China's interests in terms of sovereignty, security and development, and uphold its foreign policy purposes of maintaining world peace and promoting common development. China will unswervingly follow the path of peaceful development. This is a strategic choice the Chinese government and people have made in light of the development trend of the times and their own fundamental interests. The Chinese nation is a peace-loving people, and China is always a staunch force safeguarding world peace. We are committed to combining the interests of the Chinese people with the common interests of the people of other countries, and always stand for fairness and justice. We maintain that all countries, big and small, strong and weak, rich and poor, are equal. We respect the right of the people of all countries to independently choose their own development path. We will never interfere in the internal affairs of other countries or impose our own will on them. China works for peaceful settlement of international disputes and hotspot issues, promotes international and regional security cooperation, and opposes terrorism in any form. China follows a national defense policy that is defensive in nature, and it does not engage in arms race or pose a military threat to any other country. China opposes all forms of hegemonism and power politics and will never seek hegemony or engage in expansion. China will unswervingly follow a win-win strategy of opening up. We will continue to contribute to regional and global development through our own development, and expand the areas where our interests meet with those of various sides. While securing our own development, we will accommodate the legitimate concerns of other countries, especially other developing countries. We will increase market access in accordance with internationally recognized economic and trade rules, and protect the rights and interests of our partners in accordance with the law. We support international efforts to help developing countries enhance their capacity for independent development and improve the lives of their people, so as to narrow the North-South gap. We support efforts to improve international trade and financial systems, advance the liberalization and facilitation of trade and investment, and properly resolve economic and trade frictions through consultation and collaboration. China will never seek benefits for itself at the expense of other countries or shift its troubles onto others. China is committed to developing friendship and cooperation with all other countries on the basis of the Five Principles of Peaceful Coexistence. For developed countries, we will continue to strengthen strategic dialogue, enhance mutual trust, deepen cooperation and properly manage differences to promote long-term, stable and sound development of bilateral relations. For our neighboring countries, we will continue to follow the foreign policy of friendship and partnership, strengthen good-neighborly relations and practical cooperation with them, and energetically engage in regional cooperation in order to jointly create a peaceful, stable regional environment featuring equality, mutual trust and win-win cooperation. For other developing countries, we will continue to increase solidarity and cooperation with them, cement traditional friendship, expand practical cooperation, provide assistance to them within our ability, and uphold the legitimate demands and common interests of developing countries. We will continue to take an active part in multilateral affairs, assume our due international obligations, play a constructive role, and work to make the international order fairer and more equitable. We will also continue to conduct exchanges and cooperation with the political parties and organizations of other countries, and strengthen the external exchanges of people's congresses, CPPCC committees, the armed forces, localities and people's organizations to enhance mutual understanding and friendship between the Chinese people and the people of other countries. China cannot develop in isolation from the rest of the world, nor can the world enjoy prosperity and stability without China. The Chinese people will continue to work tirelessly with the people of other countries to bring about a better future for humanity. Socialism with Chinese characteristics is a cause that demands reform and innovation. To stand in the forefront of the times and lead the people in opening up new prospects for the development of the cause, the Party must improve itself in a spirit of reform and innovation and stay as the firm core of leadership for this cause. The Party was founded 86 years ago, it has governed the country for 58 years, and its current membership totals more than 70 million. Therefore, the Party's task to build itself has become more arduous than ever before. The reform and opening up led by the Party have injected tremendous vigor into the Party, but they have also exposed it to many unprecedented tasks and tests. Developments and changes in the global, national and intra-Party conditions make it both vital and urgent for us to strengthen Party building in a spirit of reform and innovation. To achieve the main objectives of strengthening the Party's governance capability and vanguard nature, we must ensure that the Party exercises self-discipline and is strict with its members, and work to fulfill the requirement for serving the people and being pragmatic and incorruptible. We must strengthen Party building in all respects. Ideologically, we will focus on fortifying the convictions of Party members. Organizationally, we will put emphasis on bringing up Party members and cadres of quality. In improving the Party's style of work, we will stress the maintenance of its close ties with the people. Institutionally, we will emphasize improving democratic centralism. In enhancing the Party's capacity to fight corruption and uphold integrity, we will focus on improving the institutions for punishing and preventing corruption. All this will enable the Party to remain a ruling Marxist party that is built for public interests and exercises governance for the people; a party that is realistic, pragmatic and committed to reform and innovation; a party that is hardworking and clean; and a party that is full of vigor and enjoys solidarity and harmony. 1. Thoroughly study and apply the system of theories of socialism with Chinese characteristics and focus on arming the whole Party with the latest achievements in adapting Marxism to Chinese conditions. Ideological and theoretical development is of fundamental importance to Party building, and the Party's innovation in theory guides innovation in all other areas. To build a party committed to learning, we need to thoroughly study Marxism-Leninism, Mao Zedong Thought, Deng Xiaoping Theory and the important thought of Three Represents and launch a Party-wide campaign to intensively study and apply the Scientific Outlook on Development in light of the dynamic practices of reform, opening up and modernization. We must follow the developing Marxism as our guide in changing the objective world and remolding the subjective world, better grasp the laws concerning the Communist Party's governance, socialist construction and the development of human society, and improve our capability to apply scientific theories to analyzing and solving practical problems. We must step up education for Party members and cadres to cherish the Party's ideals and beliefs and uphold high ideological and moral standards, so that they will set an example in putting into practice the socialist core values, firmly believe in the lofty ideal of communism and the common ideal of socialism with Chinese characteristics, faithfully apply the Scientific Outlook on Development, conscientiously follow the socialist maxims of honor and disgrace, and actively promote social harmony. 2. Continue to strengthen the Party's governance capability and focus on building high-quality leading bodies. Strengthening the Party's governance capability has an overall impact on Party building and the cause of socialism with Chinese characteristics. In building the leading bodies at all levels, we must focus our efforts on promptly and effectively improving their art of leadership and governance capability. Following the requirement of scientific, democratic and law-based governance, we will improve the way of thinking of leading bodies, the governing competence of leading cadres, their styles of leadership and governance, the leadership system, and the working mechanisms of the leading bodies of local Party committees that have had their staffing restructured. All this is intended to turn the leading bodies at all levels into staunch collective leaderships that are firmly committed to the Party's theories, lines, principles and policies and capable of leading scientific development. We will improve the governance capability of leading bodies in order to motivate and guide the whole Party and ensure that all the Party's work always accords with the requirements of the times and the expectations of the people. 3. Expand intra-Party democracy and focus on enhancing the Party's solidarity and unity. Intra-Party democracy provides an important guarantee for improving the Party's creativity and reinforcing its solidarity and unity. We will expand intra-Party democracy to develop people's democracy and increase intra-Party harmony to promote social harmony. We need to respect the principal position of Party members, guarantee their democratic rights, increase transparency in Party affairs and create favorable conditions for democratic discussions within the Party. We will improve the system of Party congresses by adopting a tenure system for their delegates and implementing a system of Party congresses with a fixed term on a trial basis in selected counties, cities and districts. We will improve the working mechanisms of local Party committees at all levels and their standing committees and let the Party committees make decisions on major issues. We will strictly implement democratic centralism, improve the system that combines collective leadership with division of responsibilities among individuals, and oppose and prevent arbitrary decision-making by an individual or a minority of people. We will introduce a system of voting for use by local Party committees in discussing and deciding on major issues and appointing cadres to important positions. We will establish a sound system under which the Political Bureau of the Central Committee regularly reports its work to plenary sessions of the Central Committee and accepts their oversight, and the standing committees of local Party committees at all levels do likewise to plenary sessions of local Party committees and accept their oversight. We will reform the intra-Party electoral system and improve the system for nominating candidates and electoral methods. We will spread the practice in which candidates for leading positions in primary Party organizations are recommended both by Party members and the public in an open manner and by the Party organization at the next higher level, gradually extend direct election of leading members in primary Party organizations to more places, and explore various ways to expand intra-Party democracy at the primary level. All Party members must firmly uphold the centralized and unified leadership of the Party, conscientiously abide by the Party's political discipline, always be in agreement with the Central Committee and resolutely safeguard its authority to ensure that its resolutions and decisions are carried out effectively. 4. Continue to deepen reform of the cadre and personnel system and focus on training high-caliber cadres and personnel. Adhering to the principle that the Party is in charge of cadre management, we will establish a scientific mechanism for selecting and appointing cadres on the basis of democracy, openness, competition and merit. We will standardize the cadre nomination system, perfect the cadre assessment system in accordance with the requirements of the Scientific Outlook on Development and a correct view on evaluating cadres' performances, and improve the procedures for open selection, competition for positions and multi-candidate election. We will expand democracy in the work related to cadres and make democratic recommendation and assessment more scientific and authentic. We must enforce stricter oversight over the whole process of selecting and appointing cadres. We will improve the tenure system and the recusal system for leading cadres as well as the system for transferring them between different posts, the public servant system, and the system of dual administration of cadres. We will advance reform of the personnel system in state-owned enterprises and public institutions and improve management of executives suited to conditions in these enterprises. Adhering to correct guidance in appointing cadres, we will promote cadres who have political integrity, professional competence and outstanding performance and enjoy popular support with a view to increasing public trust in cadre selection and appointment. We will make greater efforts to train and promote outstanding young cadres, encourage them to work and temper themselves at the primary level and in areas with tough conditions, improve their understanding of Marxist theory and raise their political quality. We will attach great importance to training and selecting cadres from among women and ethnic minorities. We will give special attention to cadres who have long been working diligently in places fraught with hardships and difficulties. We will select excellent cadres from primary-level organizations and the frontline of production to join Party and government leading organs at all levels. We will continue to train cadres on a large scale, making full use of Party schools, schools of administration and cadre academies to substantially improve the quality of cadres. We will do a good job in all work related to retired cadres. Implementing the policy of respect for work, knowledge, talent and creation and adhering to the principle of the Party being in charge of personnel, we will make plans for training all types of personnel with the focus on high-level and highly skilled ones. We will make innovations in systems and mechanisms for personnel work and arouse the creativity and enterprising spirit of all types of personnel to create a new situation in which capable people come forth in great numbers and put their talents to best use. 5. Consolidate and develop all the achievements of the campaign to educate Party members to preserve their vanguard nature, and focus on strengthening primary Party organizations. The vanguard nature is the source of life and strength for a Marxist party, and has to be demonstrated by its tens of millions of members of quality. We must, therefore, do a good job in the basic project to build a strong Party membership and keep improving their quality. We will earnestly study and abide by the Party Constitution, raise our awareness of Party membership, introduce the practice of regularly reviewing Party members' compliance with the Party spirit, expand channels through which Party members serve the people, institute working procedures for them to stay in touch with and serve the people, and improve the permanent mechanism whereby Party members regularly go through education and always retain their vanguard nature. All this will make Party members exemplars who always keep in mind the purpose of the Party and truly care for the people. We will improve management of Party members among the floating population, improve the Party work among rural migrant workers in cities, and set up a sound unified system for dynamic management of Party members in both urban and rural areas. We will improve the quality of newly recruited Party members, optimize the composition of Party membership, and promptly deal with unqualified members. -- Primary Party organizations constitute the organizational foundation for the Party to play its governance role. We will implement the responsibility system for building the Party and advance all-round development of primary Party organizations in villages, enterprises, urban communities, Party and government organs, schools, new social organizations, etc. We will give full play to the role of primary Party organizations in promoting development, serving the people, rallying public support and promoting harmony by optimizing their setups, expanding their coverage and making innovations in the way they function. We will develop primary Party organizations to promote development of other organizations at the primary level. We will launch intensive campaigns in primary Party organizations and among Party members to encourage them to excel in their performances. We will set up a sound mechanism for mutual assistance between urban and rural primary Party organizations. We will develop modern distance learning programs for Party members and cadres in rural areas throughout the country. We will set up a sound mechanism of incentives, solicitude and assistance in the Party to show concern for cadres at the primary level, for elderly Party members and for those who live in straitened circumstances. We will pay attention to ensuring funding and space for activities of primary Party organizations. 6. Effectively improve the Party's style of work and focus on combating corruption and upholding integrity. The Party's fine style of work is a great force holding Party members together and winning popular support. We must uphold the viewpoint of historical materialism that it is the people who make history, remain committed to serving the people wholeheartedly and adhere to the mass line. We must earnestly listen to their appeals, truthfully reflect their wishes, sincerely help alleviate their hardships and do more practical work for their benefit, putting into practice the principle of exercising power for the people, showing concern for them and working for their interests. We will seek progress in every aspect of our endeavor in a realistic and pragmatic way and do more to reinforce the groundwork for long-term benefit. We need to carry out more investigations and studies, improve our styles of study and writing, cut the number of meetings and official documents, and oppose formalism, bureaucracy and deception. We need to practice economy, always be frugal and hardworking, and oppose extravagance and waste. All Party members, especially leading cadres, must uphold the Party spirit, be impeccable in moral standards and play an exemplary role in society. We need to strengthen education in the Party's style of work and Party discipline and vigorously practice criticism and self-criticism so that leading cadres will observe Party discipline and state laws in an exemplary way, carry forward the Party's fine traditions and promote new healthy trends. With the Party's fine style of work, we will be able to improve the work style of the government and the conduct of the general public. The CPC never tolerates corruption or any other negative phenomena. This is determined by its nature and purpose. Resolutely punishing and effectively preventing corruption bears on the popular support for the Party and on its very survival, and is therefore a major political task the Party must attend to at all times. All Party members must be fully aware that fighting corruption will be a protracted, complicated and arduous battle, attach greater importance to combating corruption and upholding integrity and take a clear stand against corruption. We will fight corruption in a comprehensive way, address both its symptoms and root cause and combine punishment with prevention, with the emphasis on prevention, thus effectively improving the institutions for punishing and preventing corruption. While resolutely cracking down on corruption, we will work harder to remove its root cause and take preventive measures through improving relevant institutions and expanding our efforts to curb corruption at the source. We will strictly implement the responsibility system for improving the Party's style of work and upholding integrity. We will deepen reform, make institutional innovation, foster a culture of integrity and develop a permanent education mechanism to resist corruption and decadence, a system for combating corruption and upholding integrity and a mechanism for monitoring the exercise of power. We need to strengthen the unified management of representative offices of Party discipline inspection commissions and government supervision departments, and improve the system of inspection tours. We will do our best to ensure that leading cadres are clean and self-disciplined and that Party members and cadres are better able to resist corruption and decadence. We must resolutely stop unhealthy practices that hurt public interests, and take effective measures to deal with matters that cause strong public resentment. We must see to it that all cases involving violation of law and discipline are thoroughly investigated and dealt with, and that all corruptionists are severely punished according to law without fail. Ever since its founding in July 1921, the CPC has bravely dedicated itself to the historical mission of leading the Chinese people in striving for a happy life and for the great rejuvenation of the Chinese nation. Chinese Communists have been fighting one generation after another to fulfill this mission, and countless revolutionaries have sacrificed their lives in the course. Party members in contemporary China must continue on this mission. The ongoing reform, opening up and socialist modernization drive undertaken by the people of all ethnic groups under the Party's leadership are a continuation and development of the great cause of socialist construction since the founding of the People's Republic and the great cause of the Chinese people's struggle for national independence, prosperity and strength since modern times. Reviewing the past, we feel deeply honored to carry on this sacred mission. Looking ahead, we have full confidence in fulfilling the three historical tasks of advancing the modernization drive, achieving national reunification, and safeguarding world peace and promoting common development. All Party members must be keenly aware that it will take more than a decade of continued efforts to reach the goal of building a moderately prosperous society in all respects, and decades more to realize modernization by and large, and that it will require unremitting efforts by several, a dozen or even dozens of generations to consolidate and develop the socialist system. We are bound to meet with difficulties and risks in our endeavor. We must therefore stay prepared for adversities in times of peace, be mindful of potential dangers, and always maintain our firm faith in Marxism, socialism with Chinese characteristics and the great rejuvenation of the Chinese nation. We must guard against arrogance and rashness, preserve the style of plain living and hard struggle, bear firmly in mind the basic reality that China is still in the primary stage of socialism, and work tirelessly for the cause of the Party and the people. We must study and work diligently and keep scoring achievements that can stand the test of practice and time to the satisfaction of the people. We must reinforce unity, bear the overall interests in mind, conscientiously uphold the solidarity and unity of the whole Party, maintain the close ties between the Party and the people, cement the great unity of the people of all ethnic groups, and enhance the great solidarity of all sons and daughters of the Chinese nation at home and overseas and of the Chinese people and peoples of other countries, which will give us immense strength to overcome all difficulties and obstacles and achieve new, greater victories in the cause of the Party and the people. Let us hold high the great banner of socialism with Chinese characteristics, rally more closely around the Central Committee, unite as one, forge ahead in a pioneering spirit, and work hard to achieve new victories in building a moderately prosperous society in all respects and write a new chapter of happy life for the people!